Outsource Accounting can be a great solution to solve staffing issues and expand your business. But working with a remote worker requires some adjustments in order to get the best result. Organisation is sometimes the toughest part. Many firms don’t realize just how unstructured their work flow is (or indeed how disorganized some team members may be). That scenario may manage to just about work (after a fashion) with a small internal team but once the pace of work quickens as you plug into an almost limitless resource (the outsourced accounting team) you start putting pressure on the in-house team to do their bit faster and better. The smart thing to do is to ensure you get the best possible leverage out of your in-house team. Now a sole trader can do outsourcing accounting work and gain the benefits but as soon as you get above a certain size you’d do well to employ an Admin Assistant. So for the sake of this example we’ll assume the firm has 3 staff: Principal, Senior Accountant and Receptionist. Gathers all data ready for sending the jobs to the outsourced accountant e.g. last year’s tax files, this year’s MYOB file, supporting docs etc. Note that any administrator including a receptionist can be trained up in a few days to be a Client Services Administrator (CSA). The aim is clearly to lighten the burden of your accountant – the Client Relationship Manager (CRM) and keep him or her focused on the real techie accounting stuff or business advisory work. In fact a good Client Services Administrator can even handle getting answers to queries from a client. It all depends on the complexity of the job and the queries. You may not yet have an Administrator who can be a CSA and that shouldn’t hold you back from outsource accounting work. It is most important to be systematic, then as resources allow, get leverage with a CSA as soon as you can. So we’ve dealt with job roles but there are a few other things that can be important. Since a bit of preparation is required to send a job to the outsourced accountant there is a level at which compiling info with a CRM’s involvement is not going to be efficient. You know – those ITRs that you can knock out in 30 minutes, almost as you are interviewing the client. Now BOSS can do small jobs, but once you get to 3 hours and below you need to be hyper organized with your data flow. At BOSS we strive to send just one lot of queries but sometimes it takes two rounds of queries as the client’s accounts are unravelled. The priority here is getting your client to answer queries quickly. This will avoid jobs being in limbo and unbillable. With the pace of accounting work quickened by your outsourced provider you might be surprised how many jobs can be in limbo waiting for the clients to answer queries! If your clients get stuff to you in the last few weeks before lodgement you should change this. E.g. A well run firm will send out letters to clients in July and Dec to get the next lot of work in early. When you send out letter send out the check list of data that particular client needs to give to you. Some of our clients employ a Workflow Manager. The job of a Workflow Manager is to keep things flowing. It’s a mix of job delegation, discussing jobs holding stuff up, setting targets and checking they are achieved, liaising with management and advising on improvements and assisting HR. 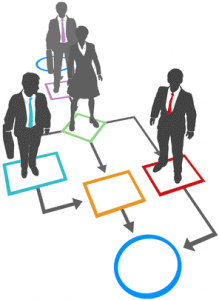 A CSA could also add the role of Workflow Manager to their duties. It all depends on the size of your firm but again – the objective is to keep accountants and Directors doing productive billable work. Communication is often neglected because it is seen as harder with an outsourced accountant. However, if you have chosen the right outsource accounting provider then communication can be as easy as dealing with in-house staff. It just takes a change in mind set. Being organised should facilitate better communication. But handling queries requires significant attention. Firms that are disorganized may struggle when it comes to handling queries. Get data upfront before handing a job to the outsourced accountant and you will avoid delays in them having to raise queries just to get the correct data in the first place. The usual round of mid-job queries should be provided to you by your outsourced accountant in a logical, digestible manner. A BOSS accountant normally emails an Excel spreadsheet of queries. The trick is to get ALL of the answers and then send the answers back to your outsourced accountant. Sending queries piece meal doesn’t help processing of the job. BOSS will normally not proceed until all queries are answered. In addition the emphasis is on the accounting firm to ensure the answers to queries are satisfactory for BOSS to continue on with the job. This avoids unnecessary back and forth communication and inefficiencies caused by both the accounting firm and outsourced accountant having to stop/start with a job. A good outsource accounting provider should allow you to have direct contact with the accountant doing the work via email and Skype. You should communicate to the outsourced accountant over Skype in the same way you would talk to your in-house staff. If you are used to having two minute conversations about queries with in-house staff or briefing staff verbally about a job, then this is how you should use Skype with BOSS. Many of our clients have daily team meetings, including their BOSS dedicated accountant on the meeting – to check on things like progress of jobs, issues outstanding etc. This smooths the work flow. BOSS has monthly client service meetings that include the main points of contact in both countries. The BOSS Account Manager looking after the accounting firm will also be present to help out when necessary. If things aren’t going as expected we endeavour to find out what the issues might be and sort them out to make sure things trundle along nicely. However, it is really up to the client firm to speak up about anything that isn’t happening as expected. Clearly an outsource accounting provider can’t help with things they haven’t been informed about. Clients can have challenges that are readily dealt with – and we know how to sort them out – but time must be invested by the accounting firm to check on progress and be available to resolve any teething problems. So my suggestion is, just like having a new employee join, in those first few months of using an outsourced accountant, have regular meetings and bring up anything that is of concern. Continue in that nurturing role until both parties are happy things are cruising along nicely. Depending on the provider you use there are tools available that allow easy communication for assisting with queries, reviewing jobs together or for control and monitoring. At BOSS we use Workflow Max. This is cloud software that allows you to see the progress of jobs and data on productivity. This level of transparency facilitates communication about such things as refining procedures for increased efficiency. Screen sharing software such as https://join.me is available to help you look at EXACTLY what an accountant is seeing. This can help with queries and with training on software and systems. BOSS is actually familiar with a huge array of accounting software but if you happen to use an obscure system, you can get a BOSS dedicated accountant trained on it. (Note: BOSS is almost unique in this regard). In summary, get organised and treat the outsourced accountant (and firm) as one of your team in terms of nurturing them, feeding them work and working cooperatively with them and you will get the results you expected.